He is RISEN! Hallelujah! Jesus has risen from the dead! 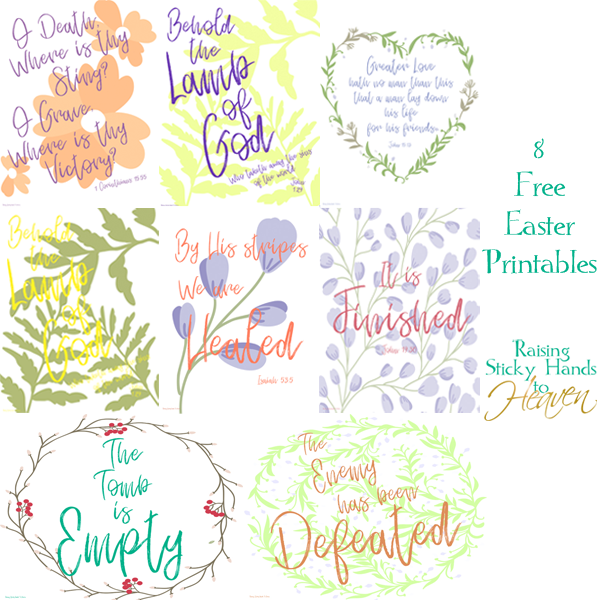 Enjoy these free Easter printables as a reminder that we are no longer slaves, for we have been washed clean by the blood of the Lamb! 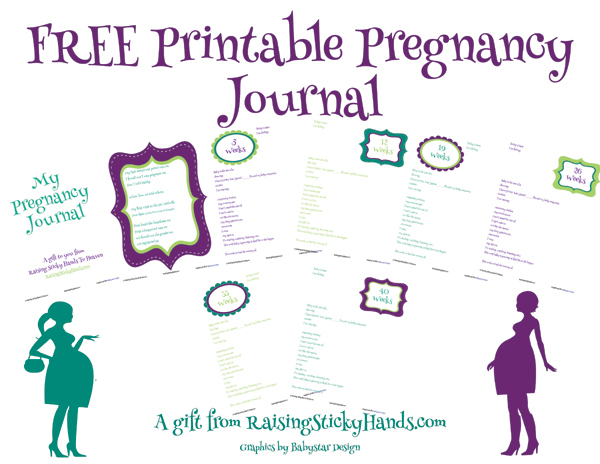 Download your printables by clicking here. 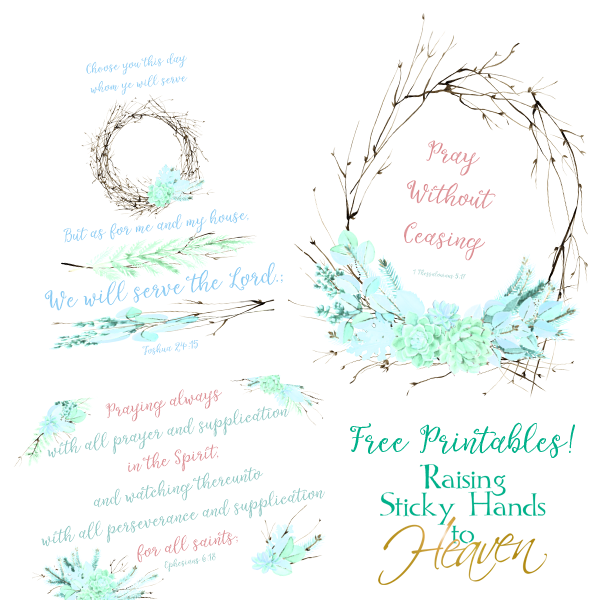 FREE PRINTABLE – He is Risen! Well, not actually. I haven’t even thought about plans for the day other than church, and we usually host dinner for our family at our house. Other details have not been worked out either. But hey, would anyone expect any different from me? Not likely. I am ready for Easter in the spiritual sense, though. For years Christmas was my favorite holiday, but in the last few years Easter has become the frontrunner in the favorite of all days of the year. Christmas celebrates Jesus coming to earth, but Easter is when we celebrate Him overcoming death, hell, and the grave when He became the ultimate sacrifice for all of our sins and on the 3rd day resurrected from the dead. He did it all just for us. He is Risen!!! Nothing excites me more than knowing my Savior paid my complete debt… especially when I am far from worthy. I decided to make a simple little printable based on Luke 24:5-7. Isn’t it wonderful? Couldn’t you just shout? He is risen! Hallelujah! Thank you, Jesus! I want to share this joy with everyone! 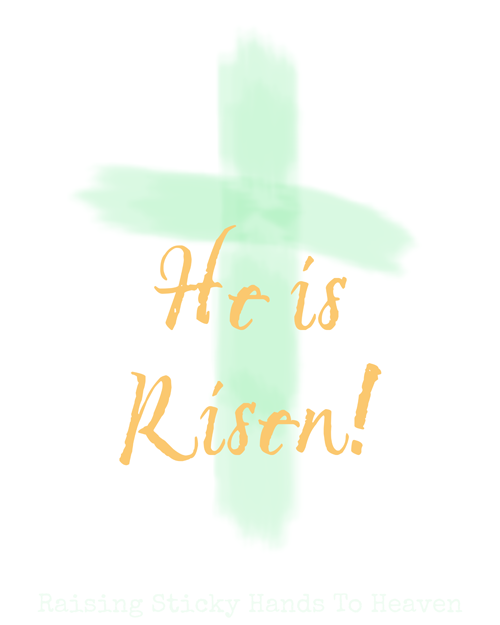 So I’m sharing this free printable as an Easter gift for each of you. Click here or the photo above to download your free He is Risen printable! I’ve been trying really hard the last few months to get in shape. With the help of Plexus, I have lost 54 lbs since the last week of April. I also have less pain (MUCH less) from my joints/fibromyalgia issues. Since losing all that weight, I am feeling more inspired to embark on other paths to becoming healthier. I’m trying to get in an exercise routine, drink more water, and take better care of myself in other ways as well. Now, in no way do I claim to be doing everything I can (though I would like to), but I am trying. I decided to put some scriptures to encourage healthy living up around the house in strategic places to remind me of the changes I am making. Since I was typing these up for myself, I thought maybe someone else would like to have a copy too. 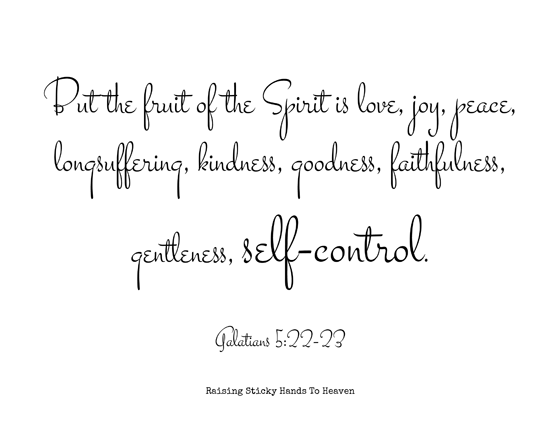 The reason I chose Galatians 5:22-23 is pretty self-explanatory, especially since I have self-control in a larger font than any of the other words. I am placing this passage on my refrigerator and inside the cabinet for our pantry. With this scripture in my face every time I feel like snacking, I can stop and think about what and why I am reaching for something to eat. Am I really hungry, or am I bored, thirsty, emotional, etc? Should I really be getting chips? Because occasionally that is okay, but maybe I should be cutting up some veggies instead. If I am reminded to use self-control with my eating, a lot of good can be done instead of “just this once” turning into “just this time every day at the exact minute”. Ecclesiastes 10:18 is going above my tv, and maybe inside my Kindle case. There are many times that I could be doing something active, but would rather do something else that does not use a single muscle. Now, as I stated above, I do have joint issues and fibromyalgia. However, that does not give me a free pass to never work out at all. There is also a kind of funny/embarrassing aspect to why I chose this scripture: I need to be reminded to do kegels. I don’t want my house leaking… I don’t think anyone else wants my house leaking either. In fact, it’s pretty frowned upon. 😉 No reason a few can’t be done every time I sit down in the living room, right? I am always beating myself up for my appearance. Saying that I lack self-esteem is an understatement. But I know deep down in my heart that I am beautiful in God’s sight. 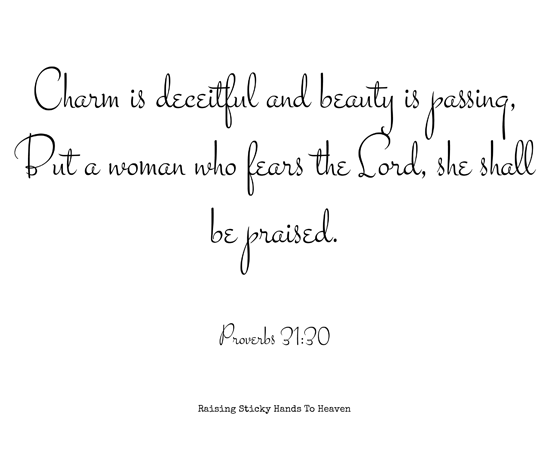 Proverbs 31:30 is going to be taped to the mirror on my vanity, so that when I am preparing to leave the house I will read those words and not walk out the door in a foul mood. It will also make me sing “That Kinda Girl” by DC Talk. Who doesn’t love a little memory from the Free At Last album in their day? If that doesn’t put me in a good mood, well, something must be really wrong that day. Can you guess where I will be taping John 7:38? If you guessed inside the fridge, you guessed right. This is for a couple of reasons: to drink more water and to remember who the life-giver is… and if I want to be healthy in this life I need to take care of His temple. I have always hated water. The taste, the way my stomach feels after drinking it, just everything. I don’t know why. But if I add a few flavor drops or infuse it with water, I handle it fine. Whatever it takes, I need to have more of it for many reasons. To learn more about Plexus, click the blog button below or go directly to Alicia’s Plexus site by clicking here. I truly tried every route my doctor suggested for a few years without any success. This has been the only thing that has worked for me so far. An answer to prayer! 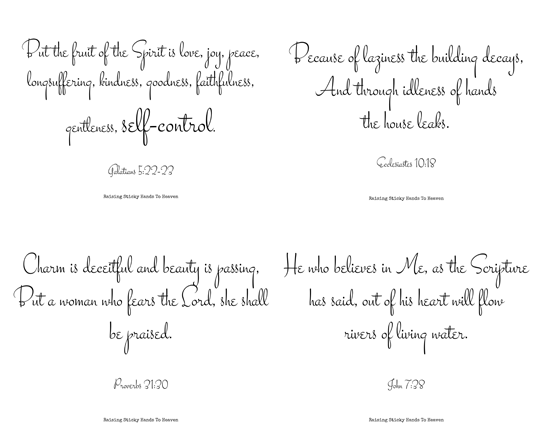 Click here or the image below to download your Scriptures To Encourage Healthy Living free printable. Do you have any scriptures that encourage you to live a healthy lifestyle? I’d love to know what they are! Please share in the comments. With all the change going on in our home, my Fall (or Autumn, if that is your preferred term, 😉 ) decor is more than lacking this year. It’s not that I don’t want to do it. It’s that I’m just way too distracted. 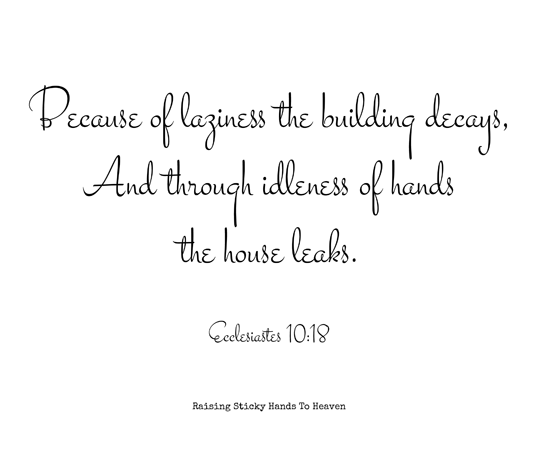 At the same time, I have been working to implement more scripture around our home. 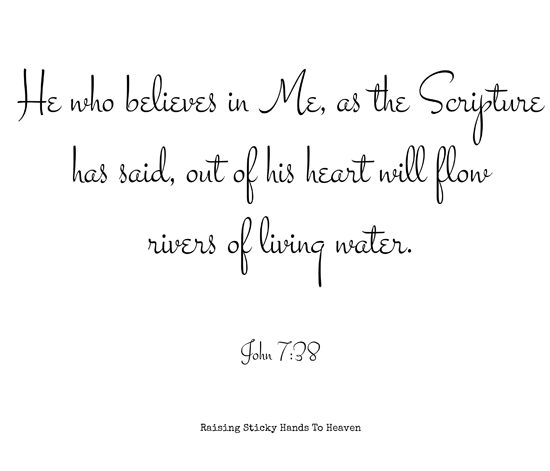 I have scriptures for encouragement, fitness, healing, and more. When I was trying to think of a verse that would fit for Fall (um, Autumn), there was one that stood out in my mind. Not only is it fitting for the season of the year we are in, but perfect for this season of my life. Since the house is lacking the leaves, pumpkins, and scarecrows at the moment, I decided to make a printable to frame. (I would say that I am going to decoupage it on to a sheet of wood, but obviously I’m not sure I even have the time to do that right now. 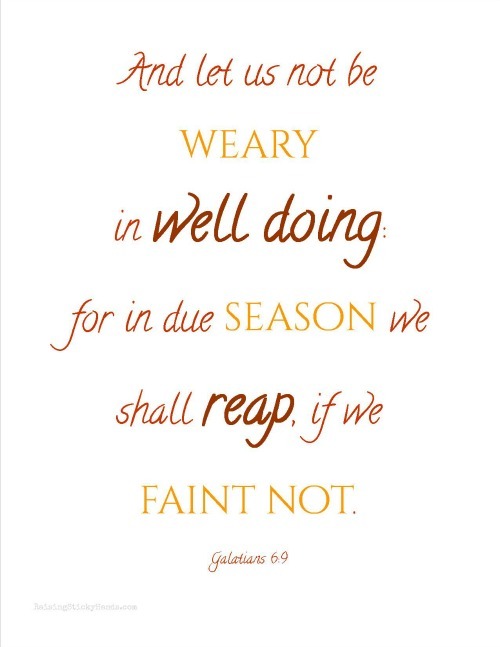 Maybe next year…) So that is what I did, I made a simple printable with Galatians 6:9 using Fall (Okay, Autumn) colors that I can throw in a frame and place on my piano or coffee bar. A great reminder, pretty, and a way to help our family memorize the scripture and put it to work. So while I don’t claim that it is gorgeous or fancy, I thought I would share it with all of you. Just in case there is someone else out there, right now, that needs this reminder as well. Happy Fall/Autumn and God bless! WalkingRedeemed.org is hosting an 8 week fitness challenge (Recapturing Your Beautiful) and I’m so excited to be joining! This fitness challenge is spiritual as well as physical and comes with the chance to win awesome prizes weekly. And before you start with “I can’t do this because,” you should check out the complete details. This is basically a Customize Your Own Routine/Schedule with few very doable requirements, which is my favorite part! I am beyond ready to be involved in this because it’s EASY. When it comes to health/fitness, easy is the key for me or I know I will give up. I’m not even going to lie to you. And knowing myself as I do, there’s still a possibility that I’ll want to flake. That’s why I picked our very own Angie to be my accountability partner, along with YOU. Yes, you! I want you to hold me responsible. Check in and ask me how it’s going. Perhaps you will even head over to Walking Redeemed to sign up and you can let us know how you’re doing with it, as well. It’s easy for me because I get to design my outline. See, I’m not big on exercise (just because I don’t discipline myself like I need to) and I eat way too much unhealthy food (and I’ll admit I’m not willing to give up too much of that quite yet… I know, I know). My main focus is going to be eating a tad healthier —- 😉 —- but mostly to exercise regularly. And I’m also looking forward to the spiritual aspect. Confession time (as if admitting that I’m a junk food junkie wasn’t enough): I actually struggled not with joining this challenge, but with joining it publicly. Why? I don’t want to deal with scoffers. That’s right. I am undeniably a “skinny girl.” I am blessed with a high metabolism and I always hear comments like, “We need to hold you down and force feed you chocolate!” or “You need to gain some weight!” I was afraid that in announcing that I’m joining a fitness challenge I would hear similar things (for example: “Like you really need to exercise!” *cringe*). Apparently, it’s okay to openly judge someone’s weight/figure as long as they aren’t obese. And when you’re the skinny girl, you’re not allowed to have self-esteem or body issues, either. So I usually keep things like this to myself because I don’t really want to hear the criticism. Not to mention that being pointed out, even for being skinny, is extremely embarrassing. Every Friday I will post a blog about ‘my week so far.’ Please be sure to check out the Recapturing Your Beautiful 8 week challenge at WalkingRedeemed.org and let us know if you’re going to join us! Click here to visit Walking Redeemed! *”Spiritual Exercise” is one of the requirements from WalkingRedeemed.org that I’m really excited about! *10 Minute Solutions is a workout series on DVD that I happen to have on hand and enjoy. The workouts are dances. There are 5 dances and you can pick one at a time or however many. Each dance workout is 10 minutes. The 10 minute workout includes the instructor teaching you the dance moves and helping you put them together and it really works (I have done it several times, just never consistently). I would totally break out my Richard Simmons Disco Sweat on VHS to do if we didn’t just move our VHS player to our girls bedroom. I may or may not have some of those routines memorized…. *Dance party sessions- Where I pick some of my favorite upbeat or silly songs and dance around, however I want to for 10 minutes. This should not be hard for me, especially if I involve my kids. Stay tuned if you want to know some of the songs I’ll use! *Worship Workouts- This is me choosing 10 minutes of my favorite worship songs and exercising/worshiping. Similar to the dance party sessions, but geared towards my spirit man. *Push ups- these will be the saddest push ups known to man, and I’m okay with that! *I do drink water, but not daily. I know the amounts I have chosen to include in my outline are pretty puny, but I want to start out with something I know I have more of a chance of sticking to. *I plan to do all of the workouts Monday through Friday, but as long as I do 4 out of the 5 days I’ll be happy. If I mess up or have problems or even do 3 out of the 5 days, I’m not going to give up. I’ll keep on going the next day. Legal disclaimer: I am not an expert in any way, shape, or form. I am not suggesting you go by this plan. This is simply what I am doing, on my own, for my own use. I cannot be held liable should you choose to do something I have listed here for my own use. 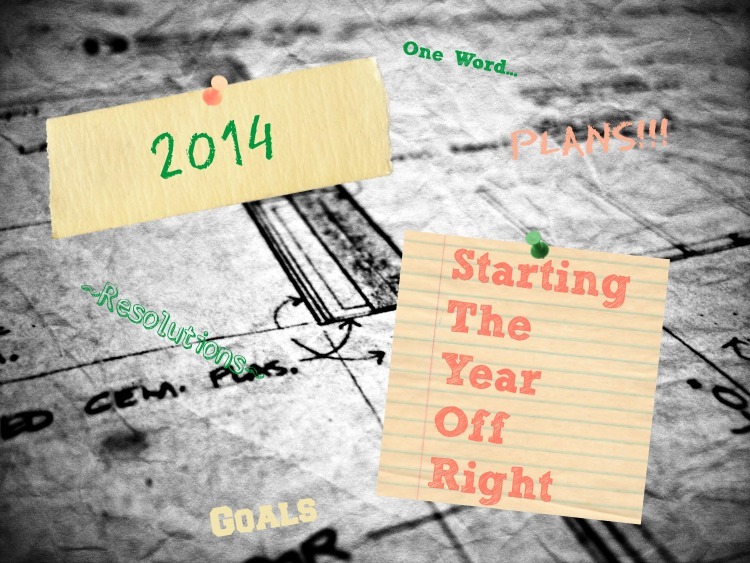 Are you trying a new fitness plan for the New Year? Are you doing the “Recapturing Your Beautiful” fitness challenge as well? I’d love to share the excitement with you! Tell me all about it! Now, how does the old song go? Christmas time is coming, the goose is getting fat! Time to download your Free Christmas Holiday Season Planning Printable Pack! You don’t have to have a penny, it’s free for you! You don’t have to have a hay penny, God bless you! Okay, I may have gotten the words wrong on that one, but I’m silly and couldn’t resist. I want to be honest with you and tell you that this printable pack is far from my best work. I drew it up in a hurry and it shows. In a perfect world, I would have started this in early October when I originally thought of it, poured my blood, sweat, and tears into it, and had it finished weeks ago so you could download it earlier. Such was not the case. But since I make myself printable lists every year for my own record, I thought I would throw something together that was pretty and share it with you all. This Free Christmas Holiday Season Planning Printable Pack has many blank lists, 2 month at a glance calendars for November & December, a budget list, and even includes 2 little sheets for planning New Year’s Eve & New Year’s Day and more. 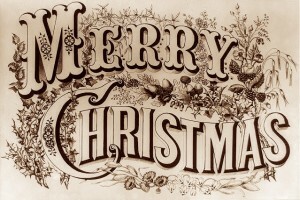 Consisting of 25 pages, the Free Christmas Holiday Season Planning Printable Pack is decorated with vintage public domain images and is rather colorful. Just right to put you in the Thanksgiving and Christmas planning spirit! This is just our humble little gift to you, from all of us here at Raising Sticky Hands To Heaven. 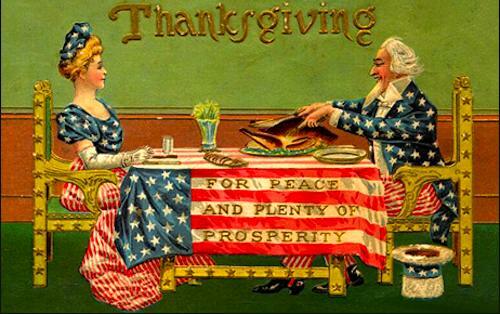 God bless, Happy Thanksgiving, Merry Christmas, and Happy New Year to you all! You can download the Free Christmas Holiday Season Planning Printable Pack by clicking here. Please, do not share this link or your download with others, but send them to this post to download a pack of their own instead. Thank you! There are so many free templates and printables out there for party planning. I know, because I’ve probably used all of them. 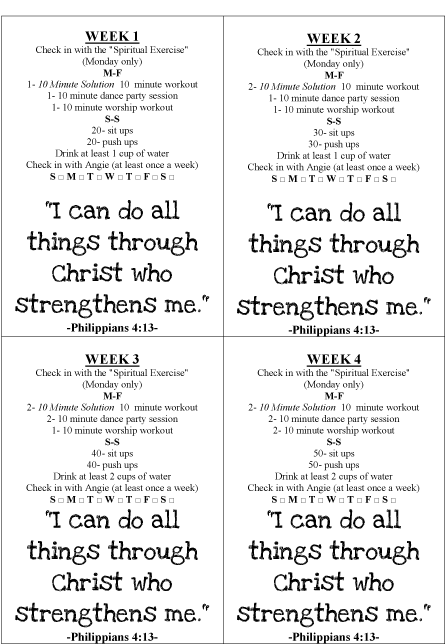 Having planned so many parties in the last few years, I’ve finally sat down and created my own. It’s not that the other printables weren’t good. It’s that if you have a large group of family and friends, like I do, you need a guest list slot that is looooong. So here it is, from me to you, all for free. Miscellaneous section, for things like bounce houses, etc. 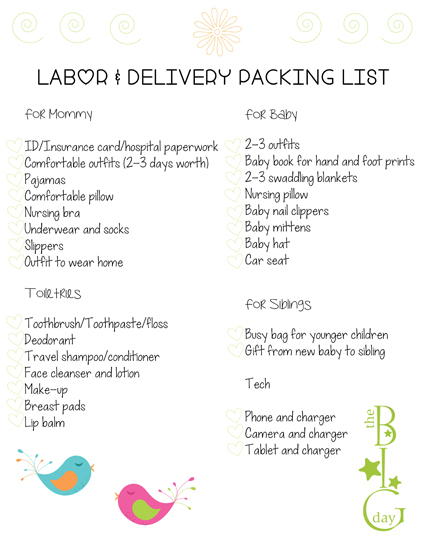 I also left blank spaces in every section to add in more items… because every party requires it’s own options! Are you like me, throwing a lot of parties? 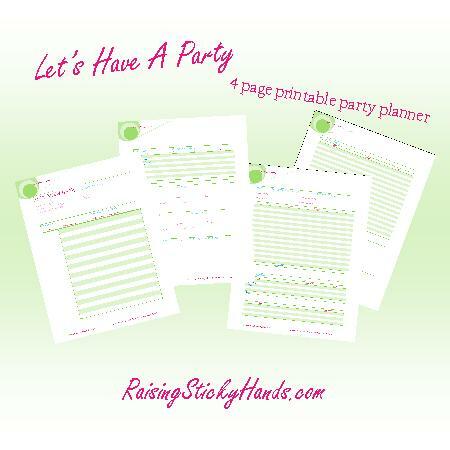 What do you look for in a party planning sheet?